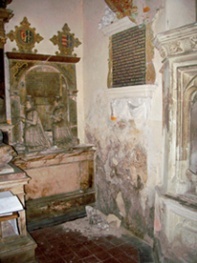 Left: Internal masonry and artefacts at Christchurch Priory were subject to damage by salts. Monitoring of the structure revealed cyclical efflorescence and deliquescence of hygroscopic salts. Their accumulation within the relatively porous masonry was probably due to sodium chloride present in the original construction and from the environment; and sulphate salts from coal-fired boilers used in the past. Intermittent heating encouraged the salts to accumulate within the surface of vulnerable materials resulting in severe localised damage. Changes in heating and ventilation were essential to ensure the long term conservation of the original fabric. Right: Severe salt efflorescence and spalling affecting decorative masonry in this mortuary chapel were the result of water and salt penetration from defective roof and ground drainage, exacerbated by intermittent heating and occupancy. Environmental monitoring using radio telemetric nodes from GE allowed the heating and ventilation to be modified to achieve optimum conditions for the long term use and conservation of the structure. Historic Churches provide differing environments from tiny chapels to vast cathedrals, from almost continually used and occupied inner city hubs to isolated structures on hilltops visited perhaps once a year, and from massive masonry structures to ‘tin tabernacles’ clad in sheets of corrugated iron. This results in a broad spectrum of environment-related problems for those trying to conserve or occupy these buildings. However, the ‘typical’ church generally includes relatively massive masonry structures and relatively large air spaces, and is usually subject to intermittent occupancy and maintenance. Consequently, historic churches tend to suffer from a range of common problems, including condensation within materials (interstitial condensation) and on their surfaces (superficial condensation), widely fluctuating temperatures, localised water penetration, and the accumulation of moisture and soluble salts. These problems have caused significant damp and decay in most churches at some time, and often result in damage to vulnerable materials and contents. A number of factors should be considered when investigating environmental problems in historic churches in the United Kingdom and abroad. Water penetration from defective or poorly maintained roof drainage is a significant cause of environmental issues in both the short and long terms. This is often due to the complexities of ecclesiastical architecture: church roofs can have numerous valley and parapet gutters making the inspection and maintenance of their drainage systems difficult. Water penetration into the base of the walls and foundations from defective ground and surface drainage is another significant source of environmental problems in the medium to long terms. This will result in damp conditions locally and throughout the structure, and crypts and other subterranean structures are particularly vulnerable. 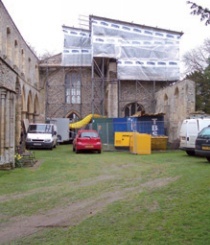 Rising ground levels around churches can also cause damp penetration at this level, particularly where adjoining streets or other paved surfaces allow water to drain back towards the structure. Again, problems with maintenance are often significant. Moisture entering the structure can also migrate into other parts of the church through evaporation and condensation. Indeed, moisture from all sources, including the outside air, is deposited as condensation when the structure is colder than the general environment. This can be a very significant cause of damp problems in churches with reduced occupancy, and is the cause of the ‘warm front condensation’ phenomena often found affecting churches in the late summer and autumn months in the UK (see below). Intermittent occupancy resulting in sporadic heating and ventilation further exacerbates problems as it encourages moisture to evaporate and condense elsewhere in the structure. This is a common problem in historic churches today as it is extremely difficult to manage intermittent heating and ventilation to ensure both the long-term conservation of the fabric and the comfort of occupants. In many cases modern interventions, including thermostatically controlled central heating systems and air conditioning, have been found to be counter-productive in that they can often result in repetitive sharp ‘saw tooth’ fluctuations in local conditions which can be very damaging to vulnerable materials. Rather, it is better to utilise the ‘buffering’ provided by the mass of the original fabric to control and stabilise temperature, relative humidity and acidity/alkalinity (pH) in a ‘failsafe’ way. In order to achieve this it is necessary to consider the local micro environments and materials, and their response over time. This may require monitoring over days, weeks, months or years depending on the periodicity of the phenomena being monitored. In these circumstances, active or passive monitoring is often necessary in order to diagnose and control the problem. 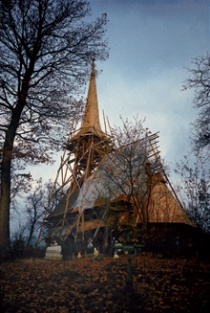 However, it is important to recognise that the fabric of an old church provides scientists and conservators an invaluable record demonstrating the effects of local environments on existing materials and structures over time: the fabric can therefore be read to determine the probable effect of the existing environment or planned interventions in the future. It should also be borne in mind that the inadequately planned or installed automatic ‘data logging’ which is often carried out, is rarely cost effective and often results in the generation of large quantities of data that is of no practical benefit. Warm front condensation occurs when warm moisture-laden air enters relatively cold massive masonry structures. 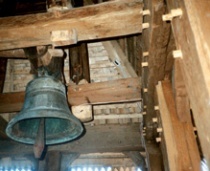 It can be a particular problem in towers and crypts in churches with reduced occupancy. In its most extreme form in the west of England, Wales, Ireland and Scotland, this results in the phenomenon of ‘green churches’ where the masonry structures remain wet for so long that they become covered with algal growth. Paradoxically, persistent damp conditions in these cases can result in the near perfect preservation of decorative masonry. However, intermittent drying may lead to severe salt efflorescence (a bloom of crystallised salts) and spalling of masonry. Persistent damp conditions from warm front condensation can also result in decay and damage to timbers or other vulnerable materials. In all cases, it is necessary to diagnose the cause by monitoring relative humidity, temperature and dew point in affected structures over some time. Remedial measures generally include the control of heating and ventilation to minimise condensation, in conjunction with long-term monitoring. Chronic problems of water penetration through defective roof drainage or due to deficiencies in ground and surface drainage result in suitable environmental conditions for fungal decay to timber elements. Softwood timbers built into masonry without adequate through- and cross-ventilation to building voids also provide the ideal environmental conditions for dry rot. In the past, remedial treatments for timber decay have resulted in severe loss of historic fabric and unnecessary damage and expenditure. Hutton & Rostron and their staff have been strongly advocating environmental control of timber decay for nearly 30 years. Control of water penetration, encouragement of drying of the structure, and adequate provision of through-ventilation to building voids are now more widely recognised as being all that is necessary to prevent the environmental conditions for fungi to grow; and to prevent further decay. This allows the cost-effective conservation of the maximum of historic fabric while minimising the requirement for destructive and potentially environmentally damaging remedial works. In these cases, the installation of long-term roof drainage monitoring alarm systems can be cost effective. Damage to timbers caused by the larvae of wood boring beetle, such as death watch and common furniture beetle, is a problem commonly reported in historic churches. However, the larvae generally only affect the sapwood band of timbers, and may not be structurally significant unless associated with wet rot. As with fungal decay, persistent damp conditions are usually required for these organisms to flourish, and oak is most vulnerable where built into structures which are subject to water penetration from defective roof drainage systems or defective ground and surface drainage. 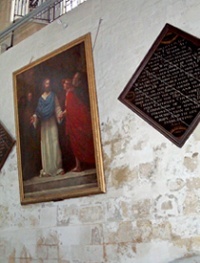 Elsewhere in churches, infestations may be the result of intermittent interstitial and cold bridge condensation due to irregular heating and occupancy. Wood boring beetle infestation can therefore be controlled by managing the internal environment to encourage ventilation and drying. 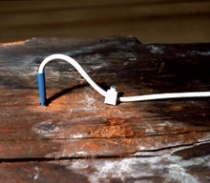 In cases of severe infestation, consideration may be given to modifying the environment in the short term to raise temperatures above those at which the wood boring beetle larva can survive within the timbers by carrying out a ‘heat treatment’. In these cases, careful monitoring and management is required to prevent environmental conditions developing that would result in damage to other materials. dust and holes in the leadwork. This will allow water penetration into the structure providing conditions for further damp and decay problems. Lead usually reacts with carbon dioxide and water to form a stable patina of lead carbonate, but intermittent cold bridge condensation beneath lead sheeting produces distilled water containing little or no carbon dioxide. New lead which has not patinated reacts with this moisture to form an unstable coating, and this can lead to severe corrosion. The process may significantly reduce the service life of the lead sheets, especially if un-patinated rolled lead has been used, as was often the case in the 1960s and 1970s. The resulting lead oxides may also represent a health hazard. Corrosion may become so severe as to result in failure of the lead sheeting, and the consequent water penetration provides conditions for damp and decay in other structures. It is generally possible to prevent lead sheet corrosion by controlling the micro-environments within the roof structures to prevent condensation, following the recommendations in current Lead Sheet Association guidelines. Intermittent damp conditions will also result in severe corrosion to steel or wrought-iron fixings, with structural failure or damage to adjacent materials. Corrosion may be reduced by controlling the environment, but in some cases it may be necessary to consider cathodic protection. This involves using a sacrificial anode or applying a permanent electrical voltage to the metal to disrupt the electro-chemical reaction that causes iron and steel to corrode. However, replacement and structural repair is often required. Masonry and plaster almost invariably contain soluble salts, whether inherent or acquired from other sources such as pollution and groundwater. Chronic problems of water penetration can result in their transportation and accumulation within porous materials such as masonry and plaster finishes, wherever moisture evaporates. Cyclical changes of environment and relative humidity in the local micro-climate may then result in efflorescence and deliquescence (where hygroscopic salts dissolve in the moisture they draw from their surroundings), resulting in further concentration of the salts within the pores of the material. This phenomenon, which ultimately leads to spalling, can occur even in the absence of further water penetration or condensation with local relative humidities fluctuating in the range above and below approximately 75 per cent. It can be a particular problem in historic churches with decorative limestone interiors that have been subject to sulphate, nitrate and chloride salts, and is often a consequence of previous heating regimes to provide comfort for occupants or visitors. In these cases, the vulnerable materials will require specialist investigation and conservation. However, further damage can be limited by controlling the micro-environment with appropriate heating and ventilating regimes. Long-term monitoring may be required in order to manage this process. Monitoring is certainly required where damp structures are being dried out, if a sudden and unexpected massive loss of decorative finishes is to be avoided. This has been a major cause of damage to historic churches both in the United Kingdom and abroad in the past, and is likely to remain a significant problem with changes in heating and occupancy. Historic churches often contain valuable artefacts and furnishings such as organs, pictures, vestments and documents. These often include organic materials, paints or other materials that are very sensitive to the environment in which they are kept. In most cases, these contents may be well preserved where they have been kept in a micro-climate buffered for temperature, humidity and pH by adjacent massive structures, and have been protected from sunlight. However, serious and irreparable damage can occur due to high or fluctuating relative humidities providing conditions for decay or chemical corrosion. Conditions may also become too dry, resulting in salt efflorescence and shrinkage. Where problems occur they are often associated with failures in maintenance or changes in heating and occupancy. Monitoring of the environment is often necessary in these cases for diagnosis, and for future conservation and management. A church undergoing environmental control by ‘heat treatment’: historic medieval oak timbers in the building were suffering from a severe and active infestation of death watch beetle (Xestobium rufovillosum). Monitoring before and during heat treatment is essential to allow proper diagnosis of the problem, and to prevent any damage to vulnerable materials during the heat treatment. The cost of heating historic churches has always been a significant factor in their maintenance and conservation, and inappropriate heating regimes have been a significant cause of environmental problems and consequential damage as described above. However, energy efficiency is likely to become an increasing problem affecting the long-term future and conservation of historic churches. Proper assessments of the existing internal micro-environments and the effect of proposed interventions are necessary, to avoid unnecessary expenditure and damage. With proper information from monitoring and site investigations it is often possible to devise options that improve energy efficiency and are good for the long-term conservation of the historic fabric, even if this involves encouraging the occupant to wear warmer and more historically correct clothing to allow increased ventilation and reduced ‘air heating’! An independent and open minded approach is required when investigating building environments and environmentally-related problems in historic churches if cost effective conservation is to be achieved. This will often require the profiling of affected structures for moisture and salt content, and the monitoring of environmental conditions for over 12 months using either manual or electronic systems. Fortunately, more cost-effective electronic and radio telemetric monitoring systems are becoming available, including intelligent networked systems (see www.senceive.com for example). 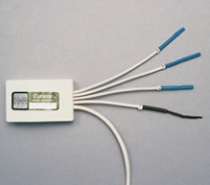 These may be deployed for short periods as part of diagnostic monitoring or adapted as an aid to long-term maintenance and conservation, such as with gutter water level monitoring and alarm sensors. This is just as well in the circumstances of the increasingly stringent requirements for energy efficiency and occupancy. If our historic churches are to have a sustainable future, we must be prepared to learn from the past as well as be prepared to deploy new technology to increase the information and knowledge available to us and to allow the conservation of historic churches, our culture and the environment. TIM HUTTON is a building pathologist and environmental scientist, and the managing director of Hutton & Rostron Environmental Investigations Limited.